Normal parathyroid glands are the size of a grain of rice. Tumor making 3021 hormone (nl=30-80). Note: This image is private domain. “What’s a parathyroid?” Most people don’t know that we have 4 parathyroid glands, the size of grains of rice, normally located right behind the thyroid gland. Their important job is to regulate blood calcium. Furthermore the majority have never heard of primary hyperparathyroidism – when one or more parathyroids become a non-cancerous adenoma that disrupts that regulation. A non-cancerous adenomas that was surgically removed is pictured on the left . When blood calcium is high, that is an indication that one or more parathyroid glands are over producing parathyroid hormone (PTH) Patients are not familiar with what symptoms are associated with the high calcium and not aware that the symptoms they are experiencing, often for many years, are being caused by a disease. Frequently symptoms are attributed to menopause or thyroid conditions, diagnosed as osteoporosis or treated as mental health problems without further investigation as to whether primary hyperparathyroid disease might possibly be the root cause. “Let me give you something that will help you with your anxiety/ stress/ depression.” OR “You’re prone to getting kidney stones, let’s put you on a special diet for that”. Patients cannot assume that their General Practitioner or Endocrinologist, if referred, will know a great deal about parathyroid disease. Based on our experiences and that of others, patients must be prepared to potentially be their own advocates. Lab results that do not present classically (high calcium, high PTH and low Vitamin D) can create confusion and delay diagnosis without a knowledgeable physician and/or endocrinologist guiding the process. We found that we had to search for answers on our own. This includes, but is not limited to requesting Calcium, PTH and Vitamin D blood tests, asking for copies of lab reports to review values, self-diagnosing in one case, advocating to get referred in another, and independently doing extensive research in order to select a highly skilled surgeon that performs parathyroidectomies using advanced surgical techniques. Raise Awareness among medical and mental healthcare professionals. * Note: AAES published their updated guidelines in August 2016. We are currently reviewing them but at first glance, do not believe the reflect the highest standards for surgical techniques currently available. “both symptomatic and asymptomatic patients benefit from surgery”. From a patients perspective, too many general practitioners and endocrinologists continue to take a “wait and see” approach and we are unclear as to why. It does appear that positions and guideline statements among the various medical professional organizations are not aligned and/or have not been updated recently and this may be contributing factor to the confusion. Patient experiences seem to indicate that most, if not all patients ARE symptomatic. Perhaps the reason it appears that they are asymptomatic is that symptoms may go unreported because the patient doesn’t realize they are related to a disease, they are often dismissed as symptoms of aging, menopause, or thought to be related to other diseases by a physicians. Educate to ensure medical professionals are aware that those who are perhaps “perceived” as asymptomatic benefit from surgery. Advocate for position statements and best practices to be aligned among the various medical associations. 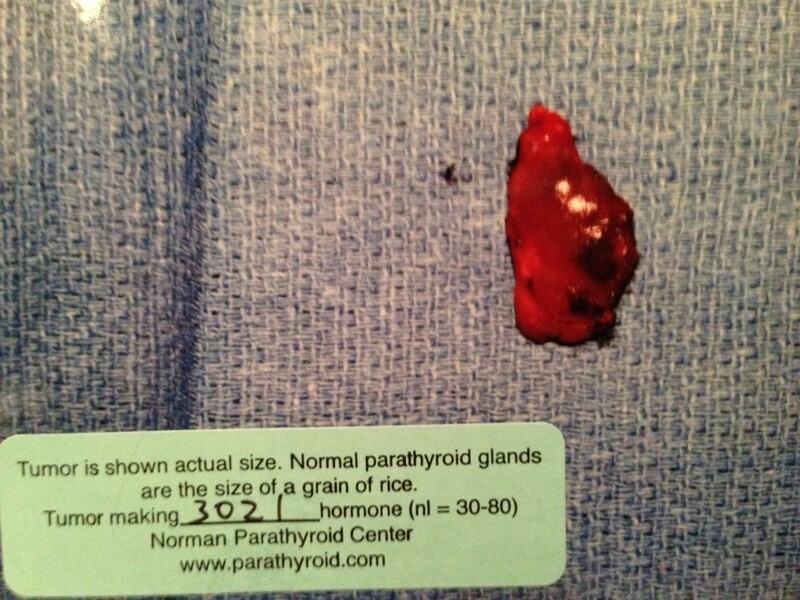 While surgical removal is the cure, the success of the surgery is directly related to the skill level of the surgeon, the number of parathyroidectomies they perform per week/year and the surgical techniques they are trained in. Once diagnosed, finding local surgeons who uses the most advanced techniques available can be difficult. As techniques used by surgeon vary, in some cases dramatically, this can be confusing to the layperson. The surgical approach to patients with PHPT is likely to remain a surgeon-specific strategy, depending on experience, preferences, and availability of new technologies. At present, no consensus exists about the need for any of these new modalities for optimal initial parathyroidoperative success, and the cost-effectiveness of these technologies, alone or in combination, may vary among differing practice environments. Ultimately, none of these technologies is a substitute for an experienced surgeon. Advocate to have a task force of the American Association of Clinical Endocrinologists and the American Association of Endocrine Surgeons revisit the issue of whether the surgical approach should remain a surgeon-specific strategy. Encourage the American Association of Endocrine Surgeons to support the development of a plan that will help ensure surgeons have opportunities to be trained in performing surgery using the latest technologies.